TheQuest University offers 7 level certification courses in TheQuest. The upper levels are virtual classes so that people anywhere in the world can attend and be certified. Upon graduation they can set up practices, chapters and or centers in their area. In this way, communities around the world are served. Levels 1-3 – TheQuest: Heal Your Life, Change Your Destiny Forums, take place in locations around the world for those wanting to Master the Art of Self Healing and fulfill a Higher Destiny Potential. They are also part of TheQuest Rehabilitation Models for prisons, rehab centers, and programs for Youth At Risk, Veterans with PTSD, and abused women. The University is also offering 7-10 day intensives in countries around the world. 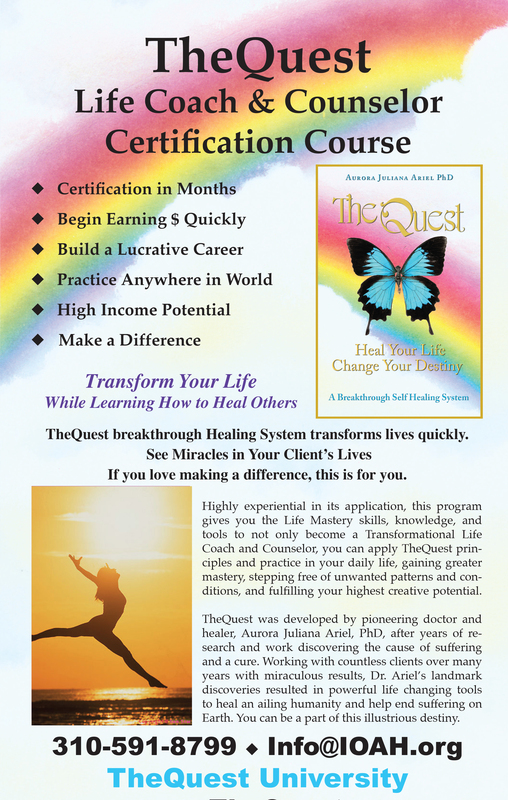 Level 4 -TheQuest: Life Coach and Counselor Certification. Highly experiential in its application, this program gives you the life mastery skills, knowledge, tools, and experience to become a Master Life Coach and Counselor. Ideal for those who have busy lives, this personalized program allows you to have a career as a Counselor and Life Coach upon graduation. This Training Course includes…Life Coach and Counseling Training, Counseling and Life Coaching Sessions, Apprenticing Starting Midway, While Building Your Practice, Ability to establish a full practice by end of course. A Mastery Training: This course is not only about becoming a great Counselor and Life Coach. It is about gaining mastery over your own psychology through TheQuest Life Mastery Path, utilizing the skills and tools you learn to deal more effectively with challenges in your own life. In this way, you are an example for your clients and someone who has paved the way before them. You know the ropes, because you've ventured into the psyche, faced and healed your own patterns, and set yourself free. Each time you have an issue or are facing a challenging situation, TheQuest begins. Applying the Seven Steps, you journey to the heart of your life challenge and find the subconscious self sabotage responsible, and heal it for the last time. Immediately Inner Peace is restored and you step forward empowered, clear and directed, taking timely action steps to powerfully direct your course to your greatest success, health, and well being. Simple, easy, and effective, TheQuest can completely change the way you experience life! When you master TheQuest, you begin to live more often in your Authentic Self and are able to easily tap into this Powerful Creative Genius, and realize your highest potential. When you master your psychology, you are no longer run by subconscious patterns and living the fate your patterns dictate. Instead, you are empowered, directed, and clear. The Master of your Destiny.